» Why Is Marvel Making a Movie About Somebody Called ‘Ant-Man’? Why Is Marvel Making a Movie About Somebody Called ‘Ant-Man’? I mean — this one kind of nerdsplains itself, doesn’t it? He’s Ant-Man, a scientist who can shrink himself down to ant size using science. He also has a helmet that lets him tell ants what to do. Whenever there’s trouble — or, at least, whenever there’s trouble that can be in some way ameliorated by the timely appearance of a giant swarm of ants and/or a human the size of a G.I. Joe — Ant-Man is there, making himself useful. 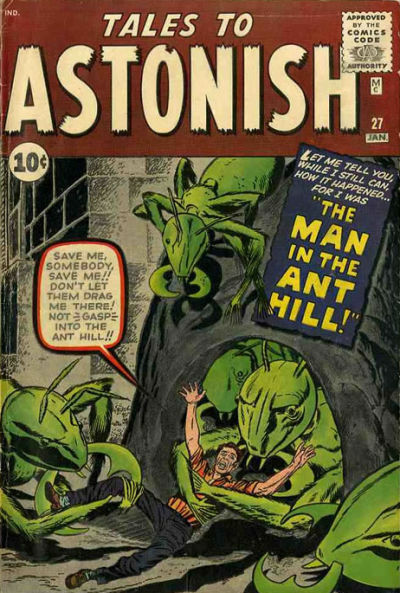 Dr. Henry Pym, the first Ant-Man, made his debut Marvel Comics appearance in 1962’s Tales to Astonish no. 27, in a seven-page story called “The Man in the Ant Hill!” Stan Lee and Jack Kirby’s game-changing superhero title The Fantastic Four was only a month old, and Marvel was still publishing a number of books specializing in non-superhero-driven sci-fi/giant-monster stories; “The Man in the Ant Hill!,” none-too-subtly derivative of the hit 1957 movie The Incredible Shrinking Man, is one of those stories. Later in 1962, as the superhero genre began to take off, Marvel reintroduced the character in Tales to Astonish no. 35, in which Dr. Pym builds his ant-controlling helmet, adopts the Ant-Man identity, and foils Communist spies by instructing his insect minions to fill the spies’ gun barrels with honey. Over the next year or so, he picked up a partner/paramour, fashion designer turned crime fighter Janet Van Dyne, a.k.a. The Wasp; both of them joined the original lineup of the Avengers when that book debuted in 1963. Hank Pym has been kicking around the Marvel Universe more or less continuously ever since. He became Giant-Man for a while, and then Yellowjacket. He was crazy for a while, and once smacked his wife during a domestic dispute, an incident that’s since become a defining moment of unheroic personal failure for Hank Pym as a character, even though the writer of the comic in which that scene appeared insists that it wasn’t what it looked like. Other people would subsequently wear the Ant-Man suit, including a reformed burglar named Scott Lang and, more recently, a rogue S.H.I.E.L.D. agent named Eric O’Grady, who donned stolen Ant-Man tech in The Irredeemable Ant-Man, canceled after 12 issues in 2007. But that was way back in 2006, presumably many drafts ago; it’s unclear how deep into the Ant-Man mythos the Wright movie will go. Not that it really matters — what Marvel’s really selling here is Edgar Hot Fuzz Scott Pilgrim Wright doing his tongue-in-geek-cheek action-extravaganza thing in the Marvel Movieverse sandbox. It doesn’t matter that Ant-Man’s historically been a silly, boring character; Avengers grossed $1.5 billion, remember, and at this point, Marvel’s in a decadent, playing-with-house-money, we-make-our-own-luck phase, green-lighting projects like a S.H.I.E.L.D. TV series apparently geared toward rabid fans of Clark Gregg’s work as exposition-spouting plot-mover-alonger Agent Coulson, and also Guardians of the Galaxy, which I’m still not entirely sure isn’t just an elaborate cover for a joint CIA/Kevin Feige plot to smuggle hostages out of Iran. We live in a world where Clark Gregg’s surprise appearance at comic-convention panels moves rooms full of people to chant “COUL-SON, COUL-SON” en masse; in that context, Ant-Man almost doesn’t seem like the dumbest possible ant-based idea on which to pull the trigger. So, uh, Ant-Man: Put your face right in it in 2015!